During last week's earnings conference call, CEO Tim Cook confirmed that Angela Ahrendts will be transitioning from Burberry and officially joining Apple this week as its head of retail. Her achievements and personality as the CEO of Burberry have been well-publicized, but her Midwestern roots, early career influences, and resulting business and life philosophies are less well-known. These characteristics were recently detailed in a lengthy profile by CNET. Ahrendts was born in 1960 in the small town of New Palestine, Indiana, where she was one of six children. As a young girl, she "lived vicariously through fashion magazines" and moved to New York after graduating from Ball State University to pursue her dream job in the fashion industry. She got her start at bra maker Warnaco and then landed a position at Donna Karan in 1989. She rose through the ranks at DK to eventually become President of the New York-based fashion house. When Donna Karan changed its focus, Ahrendts transitioned to Liz Clairborne as the executive vice president and finally landed at Burberry, where she rejuvenated Burberry's image and sales as CEO of the London fashion house. When she started in 2006, Burberry was a well-known rainwear company and upon her leaving a short eight years later, the company is now an internationally acclaimed fashion label. Ahrendts has a personal management style that keeps her in touch with her employees, traveling to stores to meet them and "communicating constantly" with them via email to thank them for their work. She credits her Midwestern values that taught her compassion towards others, humility, and hard work were the keys to success. It is this human touch that Ahrendts will be bringing to Apple's all-male executive team and will be a balance to the company's technology and engineering focus. "Technology has given us access to the world and its sea of content, allowing us to never speak to another person if we don't want to," she said. "Computers and smart devices are among the greatest intellectual gifts ever created for man, but if not balanced with human contact, may offer little to develop ones heart. Don't get me wrong, I am mesmerized by this Digital Tsunami, but Google doesn't have all the answers, and are all those people on Facebook truly your friends?" Ahrendts will be joining Apple at a time when its retail sales are flat, despite an increase in the number of retail stores opening worldwide. As noted by Bloomberg's European correspondent Caroline Hyde, analysts are watching Ahrendts closely with the expectation that she will bring her luxury flair to Apple's retail operations and repeat with Apple what she did with Burberry. Ahrendts will head up Apple's retail push in 2014 and beyond after several years of instability in the division. The company confirmed during its recent Q2 2014 earnings conference call that it will continue to invest in retail stores in 2014. It recently opened its first retail stores in Brazil and Turkey, expanding Apple's retail presence to a total of 15 countries. Apple also will continue its focus on China with a plan to triple the number of Apple retail stores in the Asian country over the next two years. Can we please have more articles about her? From my own knowledge, I think she will fit well in the environment. From my own knowledge, which includes nothing on Angela Ahrendts outside of Macrumors, I think she will fit pretty well in the environment. Trying to humanize retail greed by making it social...this is a new low for Apple. While all my Facebook "friends" may not be true friends, NO staff at an Apple store is ever going to be my friend, even in passing. I don't need a more personal touch to the Apple retail experience, what I would prefer if Apple reduced their prices so as to not grab 500% markup on all their devices, you know, make its a little less dehumanizing for people to buy Apple products. Surprise. Many people in the store looking for service means you need to wait for service. Maybe don't go to the store the day after that was announced next time. Apple needs something to help them out retail wise. I was just there for the iPhone 5 sleep/wake button recall and it was a mess. I had to change my appointment twice because they couldn't see me within a 30-60 minute window. When I finally did get to ask someone why I had been sitting and waiting over 20 mins to be seen, after pushing on him hard for an answer I ended up being told that they are accepting walk-ins for this issue and I was waiting for them to be helped first. I felt like Larry David when I had to explain to him the reason people make appointments and how the process should work. I hate to tell you, but going to the Apple store is a great experience for most people. That's why they go. You can go buy your Android devices at Walmart from now on, because being greeted by an 80 year old who can't make ends meet and being helped by staff making minimum wage whilst destroying small town America with cheap, Chinese crap... isn't dehumanizing at all. Can we get a daily countdown article? She should start by increasing air flow in every store. A busy summer Saturday at an Apple Store smells like hot dogs and swamp a$$. lol I know what you mean. Even in winter days, the crowded air smells like what I call "nerd and electricity". Some "floor specialists" need hygiene lessons, and that's not meant as a joke, I'm very serious. Not good. 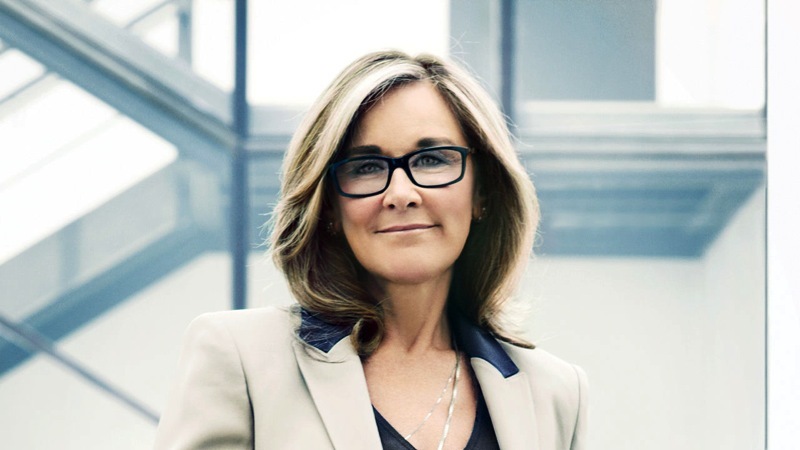 Angela Ahrendts is an affirmative action hire. She was hired for her gender. Why wasn't Ron Johnson rehired, especially considering the fact that he's largely responsible for Apple Retail stores being a massive success and the fact that he hasn't been working for J.C. Penney since April 8, 2013? Yet another bonehead move by Apple in the post-Jobs era. Not courting and rehiring Ron Johnson is in the same league of boneheaded behavior as the firing of Scott Forstall. I feel so bad for capable women and people of color. Even when you have obvious talent someone is going to claim it's because you're black or a woman.